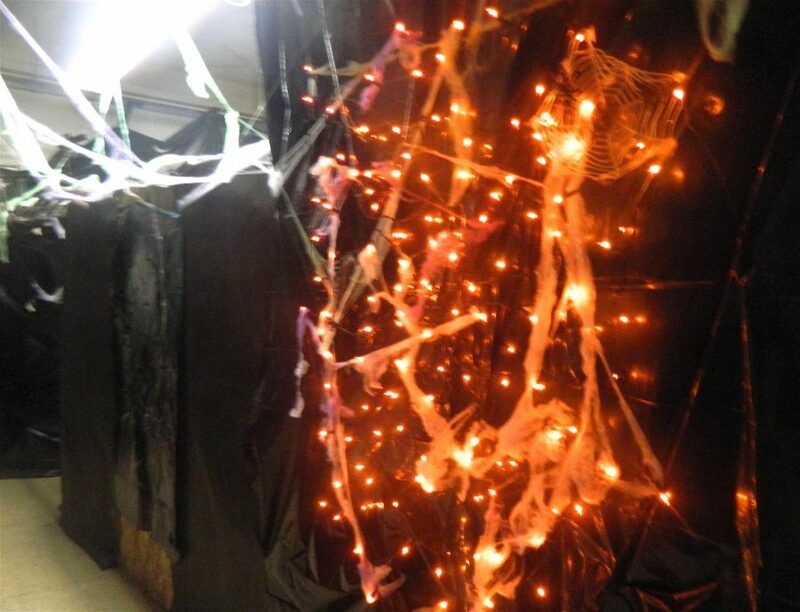 Lights and spiderwebs hang in the basement of Cunniff Elementary School in preparation for visitors to the Haunted House during the annual Halloween Party on Friday, Oct. 27, 2017, from 6-8 p.m.
Boo! Come to the Halloween Party! The annual Halloween Party will be at Cunniff Elementary School on Friday October 27, 2017, from 6 p.m. to 8 p.m. The PTO is hosting the event. The party will be in the Cunniff’s cafeteria and gym, and the Haunted House will be in the basement. “It’s a fun Halloween event for the kids at the Cunniff,” says Lee Haley of the Cunniff PTO. The event is free, but everything else is one ticket (and each ticket is $1). Because Puerto Rico was hit by the hurricane, there will be a raffle. To get a raffle ticket, you need to donate money, and the prizes include, wine, cheese, and even Launch tickets! You can also wear your costume, but there are no weapons allowed. The organizers also recommend that you leave your accessories at home, because you might get them lost. There will be refreshments that cost one ticket each. Free games, face painting, and tattoos will be in the gym. The PTO is always looking for parent volunteers to help out for events like this and more. WMS and WHS student volunteers to help out are welcomed. To volunteer, contact Lee Haley and the PTO at leephaley@gmail.com.